According to a study published by Capgemini and the Royal Bank of Canada there were twelve million so-called High Net Worth Individuals across the globe in 2012 – that is people with liquid assets upwards of one million US-Dollars. About a third of them live in Europe (roughly one million in Germany) and the study says that most of them have their economic focus on securing their wealth. But where is your money still safe in times like these? From this perspective Vienna is one of the most popular financial centres in Europe. Customers enjoy here one of the continents most extensive branch networks. Austria’s banking tradition goes back to the early 19th century and it has accumulated a great deal of experience since then. It is therefore one of the oldest and most comprehensive banking businesses in the Western world. 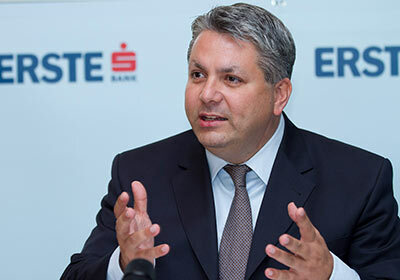 Erste Bank Group is number one of over 800 financial institutions in Austria, I measured by the financial statement 2012 with a balance sheet total of 214 billion Euros. This is a good enough reason to ask Peter Bosek, member of the board at Erste Bank and responsible for Group Private Banking, where he sees the most important advantages of Vienna as an international centre for private financial planning and asset management. Therefore Vienna offers private banking customers a multicultural melting pot where business and pleasure can be combined perfectly. Many investors have already decided to use property that they had initially bought purely as assets for themselves in order to enjoy the city’s feel good factor as often as possible. The result is a relationship that has advantages for everyone involved. ble economic and political environment. Peter Bosek, member of the board at Erste Group, is convinced that Vienna is a perfect location for private banking.